Hi everyone! My name is Justine and I usually write in my Justine’s Halloween blog which, as you probably guessed, is Halloween themed. I am obsessively in the Halloween spirit and update my blog year round. Halloween has always been my favorite holiday, and a lot of my art reflects this. 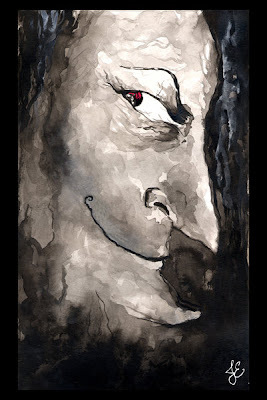 This Wicked Witch is one of my Halloween paintings. Click Here if you would like to see more of my Halloween art. I have been looking forward to contributing to The Gravedigger’s Local 16 blog. Writing a guest entry for this blog will give me a chance to focus on topics that are dark and edgy but not strictly Halloween in theme. This entry begins with the mystery of a man who was a sculptor of monsters (at least in my mind). After a brief trip to a TV sideshow, we’ll visit a real sculptor of monsters and a real sideshow performer. I paged through the GDL16 blog while deciding what to write. This might sound strange, but the first thing the GDL16 blog entries reminded me of was the beginning of a certain X-Files episode. In this particular episode, as I remember it anyway, Agent Mulder visits a workroom where a sculptor is making monster masks, prosthetics, etc. The dark workroom is covered in his fantastic creations. Surf music is playing while the sculptor works. I planned to write more about this episode, and offer up some trivia. The problem is that I couldn’t find a thing about this episode online. Now I’m wondering if this workshop scene is just something in my head that I’m attributing to the X-Files. Since I couldn’t find any proof of the episode’s existence, I’m going to instead share a little about my favorite X-Files episode. I’ve actually been reminded of the “Humbug” episode during the past few days. One reminder came from discovering the monster maker, Tom Kuebler. This sculptor has created some of the most detailed, life like, and horrifying sculptures I have ever seen! Tom Kuebler is much like the man in my original X-Files memory – a builder of amazing creatures. Many of his creations also tie in with the “Humbug” episode, because they are tributes to sideshow performers. One of his sideshow inspired sculptures is of “Schlitzie” who worked for Barnum and Bailey as well as other circuses. For those who aren’t familiar with Schlitzie, he had Microcephaly, meaning he had a very small skull and brain, and the cognizance of someone around three years old. Although Schlitzie was given to a carnival act by his parents, he went on to be loved and cared for throughout his life. Schlitzie was even adopted by a fellow circus performer! His life took many twists and turns, which you can read about here. Although I am a huge fan of the X-Files, reality is a lot more interesting than the any of this show’s plots. Tom Kuebler is far more talented than the sculptor in my X-Files memory, and Schlitzie’s life is far more intriguing than the “Humbug” plot. Great blog post. I love sharing with other bloggers. Great fun and good way to meet other bloggers (or in this case visit one of your favorite at another location. ) Enjoyed it very much! We are very fortunate to have Justine and others like Mr. Betram Bertram contribute here. It’s always nice to make new friends – and find out new things.